Lacovara's titanosaur has been described, named, and even 3D imaged! 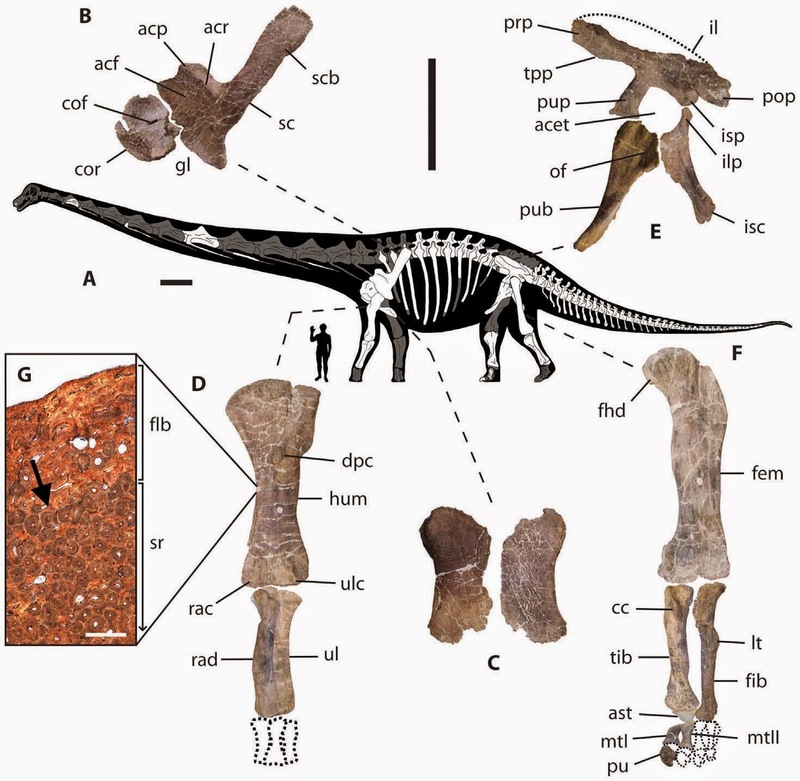 Dreadnoughtus schrani, read about it here: http://www.nature.com/srep/2014/140904/srep06196/full/srep06196.html . I saw this animal in preparation at the lab in Carnegie Museum long before it had a name, and I had the opportunity to speak with Dr. Lacovara himself at SVP 2010 and 2011 about this animal's morphology and likely lineage, so seeing the fruits of the Drexel team's work is personally satisfying. 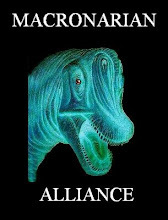 And unlike many instances of new dinosaur names, this one fits the bill perfectly. Dreadnoughtus is indeed a dreadnought of the dinosaurs. Not the only one by any means, but it's about time sauropods got some really imposing-sounding names, not just predatory theropods like T. rex. At some point sauropods really do get too big for any predator to mess with. 1. This is the biggest dinosaur yet found. Actually, no it's not. Argentinosaurus, Alamosaurus, Puertasaurus, Ruyangosaurus, the Chubut Monster, "Huanghetitan" ruyangensis, and maybe even Paralititan and Argyrosaurus sp. likely outclass it for raw size and mass. And there are a few brachiosaurs which also might be larger, including a very big referred specimen of Brachiosaurus itself. Of course neither specimen of Dreadnoughtus is fully grown (unfused scapula-coracoid suture is a dead giveaway of immaturity) so perhaps an adult Dreadnoughtus could rank higher in the "top 10 biggest". It is however among the biggest dinosaurs that are actually complete enough to reasonably estimate their size without much room for guesswork. But nobody is officially claiming it to be the "biggest" - we know based on general large titanosauriform proportions that most or all of the aforementioned animals are larger, even if estimating just how much larger is a bit more tricky. 2. 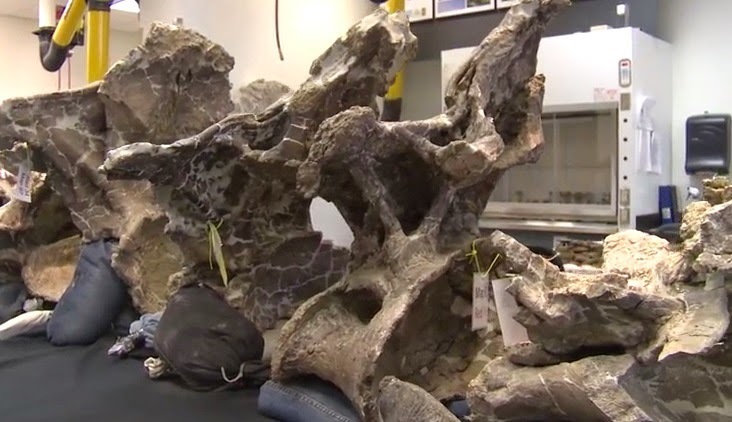 This is the most complete giant titanosaur found. This is technically true. Although it's missing most of the neck and ribs, which are largely present in Futalognkosaurus, the other contender for "most complete giant titanosaur". The fully tally of bones from the two Dreadnoughtus specimens adds up to more, especially considering the limb material, but the published diagrams and 3D scans still look less complete than Futalognkosaurus - when you composite all 3 specimens of Futa together, anyway. Surface area-wise, Futa's huge and deep neck bones at least make it appear more complete. And the referred juveniles contribute some limb material. Both animals appear to be similar in size. 3. This animal is a lognkosaur, as the paper seems to imply. What's funny is that when the fossils were still under preparation back in 2010-11, both Dr. Lacovara and myself thought it might be something much more derived, like a record-sized Aeolosaurus-grade saltasaurid, due to the forward-slanted, antenna-like prezygapophyses in the tail. Of course to be fair, most of the fossils were in fragments at the time and had to be painstakingly glued back together, and when part or all of a caudal neural spine is broken off, many unrelated titanosaurs can look deceptively like "aeolosaurs". However, after analyzing the paper I can say that a lognkosaur-like position is indeed more plausible. This animal however isn't quite a lognkosaur. Close, but not quite. The upper humerus bulges upward medially, much more like Argyrosaurus and Quetecsaurus, which has a very Argyrosaurus-like hand shape. Unfortunately hand material is missing for Dreadnoughtus, but the arm bones look Argyrosaur-like enough. 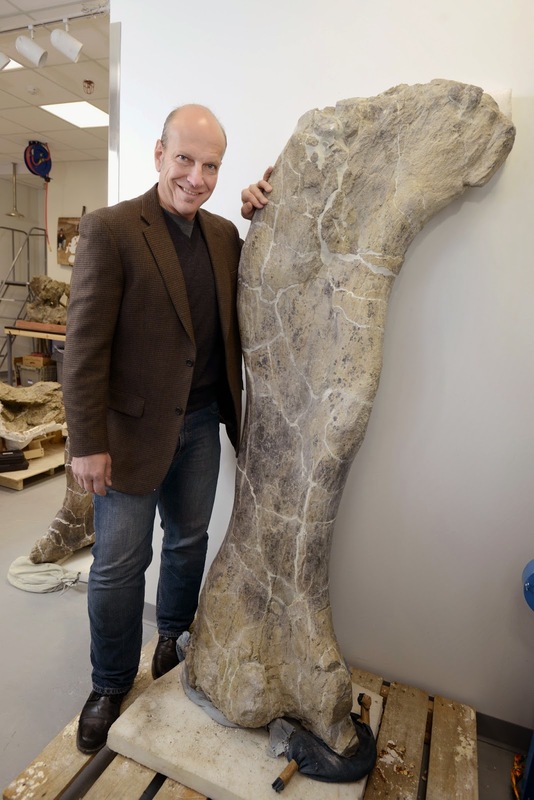 The femur is very wide and robust with a large, midlevel 4th trochanter, convex-curved upper margin, and a reduced lateral bulge - very different from any known lognkosaur femur, but very similar to the two huge "Argyrosaurus sp." femurs in the Field Museum. The dorsal vertebrae are pretty wide with substantial laminae making the neural spines triangular, but just not as wide as in true lognkosaurians. They do however bear a passing resemblance to the dorsals of "Argyrosaurus sp." (=Elaltitan lilloi) specimen PVL 4628. The paper clusters it with Malawisaurus, which it places in a more derived position than true lognkosaurs - a position that isn't supported by the humerus and femur morphology and think should be re-examined. The Paleo King ranks this species as an Argyrosaurid, probably closest to Quetecsaurus. Which is a very good thing indeed, as it (along with the even odder Quetecsaurus) greatly improves our knowledge of this obscure titanosaur family. Bones NOT to scale here! Or here, though looks may deceive! The reality is that only two of the neck bones were found, and both exhibit pretty serious crushing. And the first 3 dorsal vertebrae are missing entirely, with the 4th being seriously crushed as well. So it's very difficult if not impossible to reconstruct its neck posture accurately. 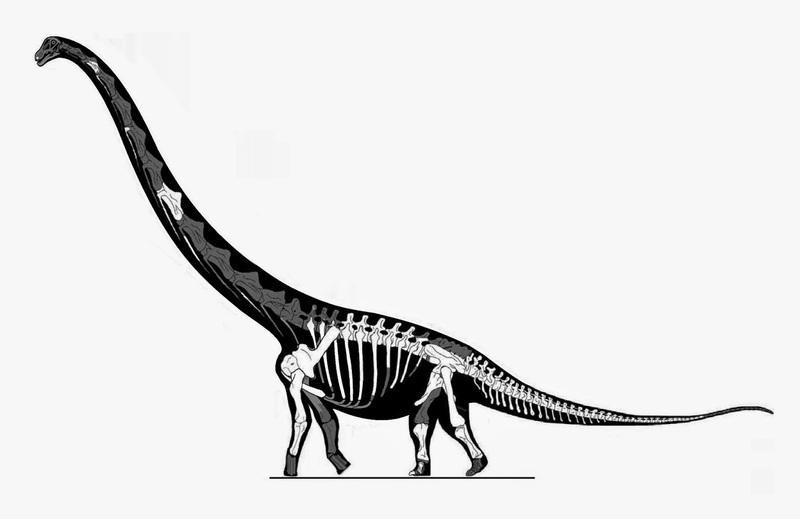 The honest answer is that we don't know what Dreadnoughtus' neck posture was. But I think it's a pretty good guess that the neck was vertical or semi-vertical as in Futalognkosaurus, not horizontal as in the published skeletal in the paper. We are definitely dealing with a high-browser here. Titanosaurs of such large size usually have the extremely long and vertical necks of high browsers - there is no point in wasting such necks to only bend down and eat ferns like Saltasaurus or Diplodocus. Even the paltry tooth material found with Dreadnoughtus is that of a high-browsing conifer eater. The 9th(?) 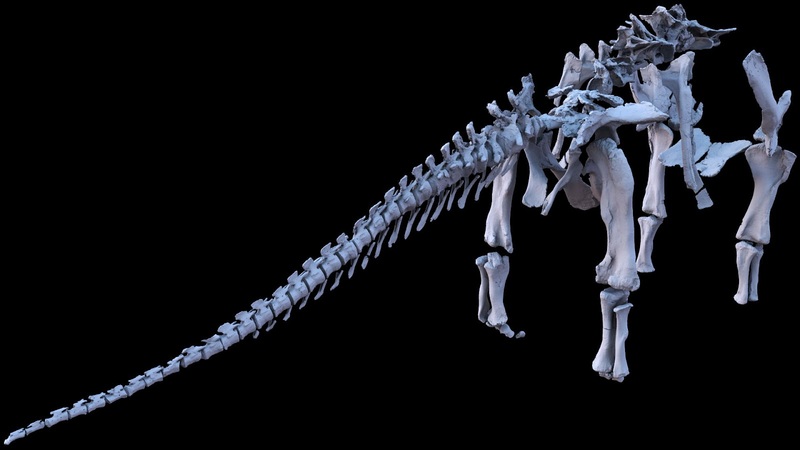 cervical is big enough to indicate an even longer neck than Futalognkosaurus, and even with the 3D model omitting any speculative reconstruction of the hands (and leaving precious little space for them), the shoulders of Dreadnoughtus are still higher than its hips. Add in hands of correct lognkosaur or argyrosaur proportions, and this will tilt up the torso and shoulders even further. And the general rule with all high-shouldered sauropods is that they also tend to be high-browsers, regardless of neck length. So we have two patterns of evidence in favor of a vertical neck. 3d model scan of the actual fossils. Even with the arm not raised high enough to leave space for the hands, the shoulders rise above the hips. Every well-preserved macronarian with this pattern exhibits a more or less vertical neck. Note that the back is pretty straight here. Original skeletal from paper - the neck seems to be horizontal to make room for more figures? The back is oddly curved, which isn't evidence by anything in the fossils, and the dorsal spines just look wrong. Where's the backsweep? Very hastily corrected version with correct-sized hands and a straighter back and more vertical neck. Now that's better! Unfortunately these days (thanks in no small part to a certain wispy white mustache from outside the field) the convention in many dinosaur papers seems to be to illustrate sauropod necks horizontal since it's seen as more "conservative" and "safe" even if it isn't meant to be literally accurate or isn't the main focus of the paper. Never mind that it wastes neck length, puts much more strain on the span of the neck than a vertical posture, and that most macronarian necks weren't built for tolerating horizontal strain for any substantial length of time... of course it's possible Lacovara and co. may have just wanted to save vertical space per page in an already large paper (publishing is getting expensive as many of us know) so I can't judge their reasoning on this particular case. 5. 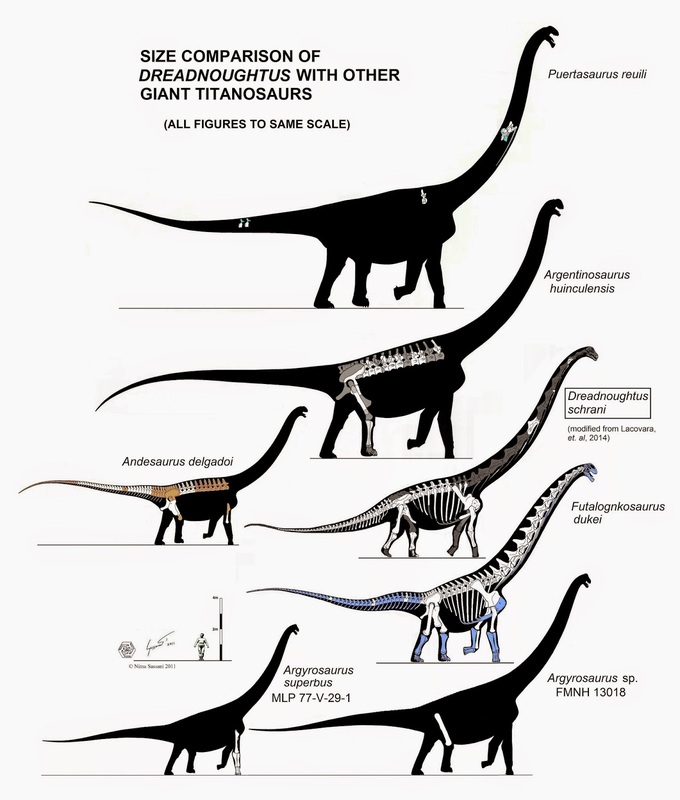 Dreadnoughtus and Puertasaurus were basically best chums. Doubtful. Although they were found very close together (something like only 13 miles apart) in Santa Cruz province in the far south of Argentina, their time horizons may be different. The exact stratigraphy of the Dreadnoughtus site is still a bit murky, and even if it is Maastrichtian in age, it may still be separated from Puertasaurus by hundreds of thousands of years if not more. And even if they did live at the same time, they may not have been buddies. Big sauropods in similar feeding niches were just as likely to compete over resources as share them. Notice that term similar niches. This did not mean that big herbivores always butted heads (or tails, as the case may be). Sauropods in vastly different feeding niches (such as brachiosaurs and diplodocids in the Morrison and Tendaguru formations) tended to coexist just fine. 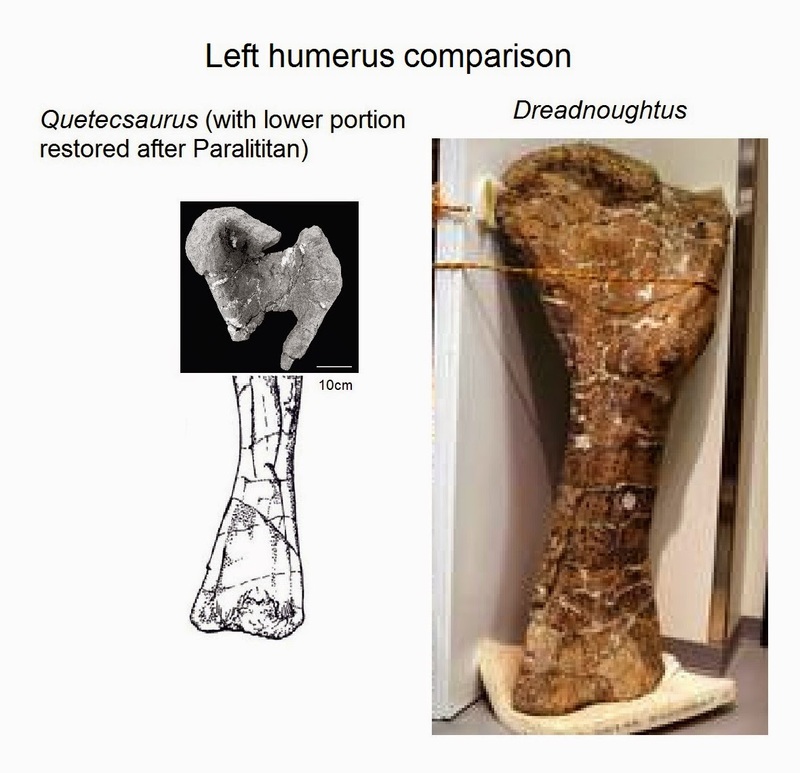 Plus, if the subadult type specimen of Dreadnoughtus (or one of similar size, around 50-60 tons) crossed paths with the Puertasaurus type (around 90-110 tons, which may or may not be an adult) then maybe "dread-nought" may have stopped being such an appropriate label! 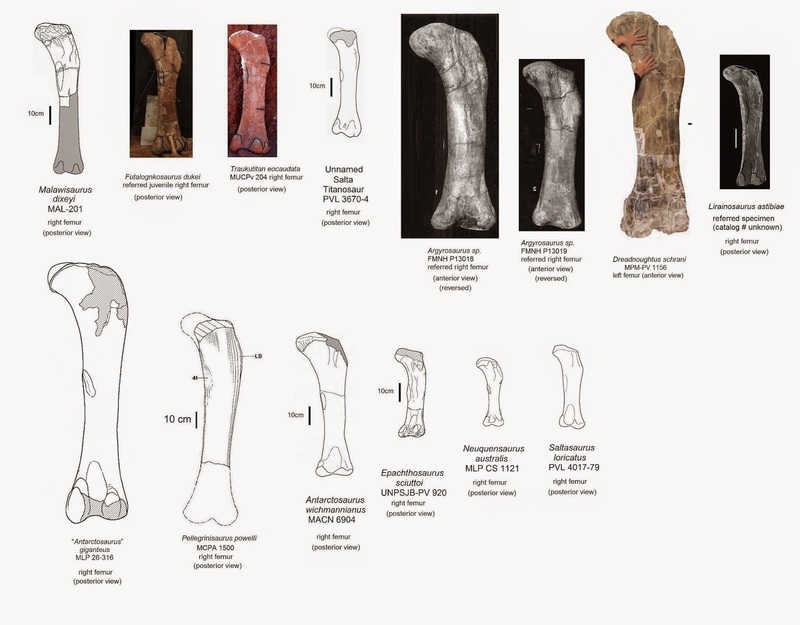 Comparing the dorsals of Dreadnoughtus with the one found from Puertasaurus, you will soon see that while Dreadnoughtus may be huge, it's definitely not in the same league. If you include juvenile specimens, then isn't Alamosaurus technically the "most complete giant titanosaur"? The tricky part about Alamosaurus is that the juvenile remains aren't all that complete, and I don't even have photos of them so it's hard to say what condition they are in - most of the data is based on Dr. Lehman's drawings. 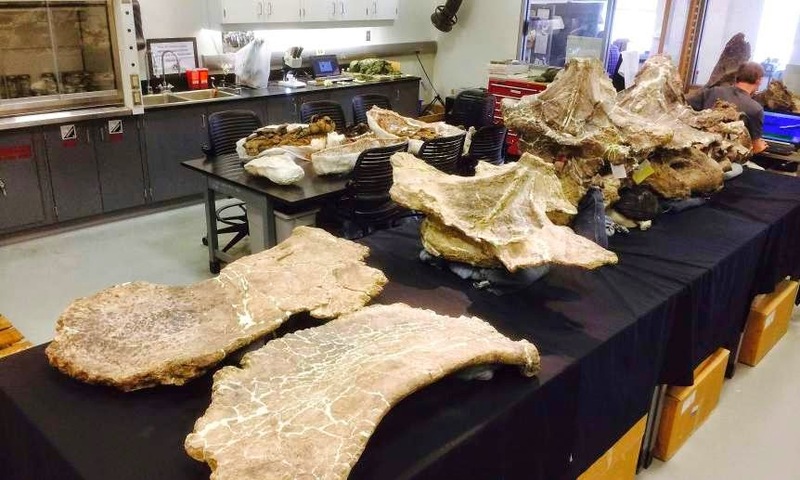 There is a lot of Alamosaurus, much of it still awaiting preparation and formal description. Also, it's possible that some of the Alamosaurus material belongs to multiple species or even genera. Until now it's all been labeled as Alamosaurus without a whole lot of analysis, with the assumption that all titanosaur material from Campanian-Maastrichtian Texas and New Mexico must be Alamosaurus. This assumption may not necessarily by true.